Admins use BetterCloud, a leading SaaS management platform, to secure and manage the cloud applications that promote innovation. To build, market, and support their products, BetterCloud turns to another cloud-based application—Lucidchart. Using technical diagrams in Lucidchart, the product development team not only understands each process better, but they also save time as they write, test, and implement code. BetterCloud's customer support manager uses Lucidchart to create thorough but easy-to-reference process flows. When new members join the support team, the manager simply shares the documentation with them so they can follow the steps to track bugs or resolve complaints. Lucidchart helps BetterCloud segment customers and align marketing processes. Once they map out their processes, leaders can easily assign tasks and implement campaigns successfully. The marketing team has even used Lucidchart to create marketing collateral, such as a diagram on how to increase user adoption in G Suite. BetterCloud, a leading SaaS management platform, helps administrators secure and manage the cloud applications that promote innovation. The company’s flagship product for G Suite is used by 2,500+ customers all over the world. Six months after its beta launch in 2012, BetterCloud was providing SaaS management for more than 5.5 million user accounts, and the company only continued to grow. To keep the company on the same page during this growth period, the BetterCloud team wanted to map out processes and systems. They needed an affordable, easy-to-use diagramming tool. What they found was Lucidchart. BetterCloud uses Lucidchart at all stages of product development, from brainstorming onward. The development team maps out workflows, new feature functionality, and even installation processes to provide deeper understanding of these processes, which ultimately saves the team time and energy as they write, test, and implement code. With Lucidchart, BetterCloud tracks each step of their support process, including filing bugs, resolving issues with the development team, and communicating updates to the client. This one process flow simplifies training when new members join the support staff and makes sure that the team never misses a vital task. The ultimate payoff? When the support team understands the process, they resolve issues quickly and make sure that customers have a positive experience. 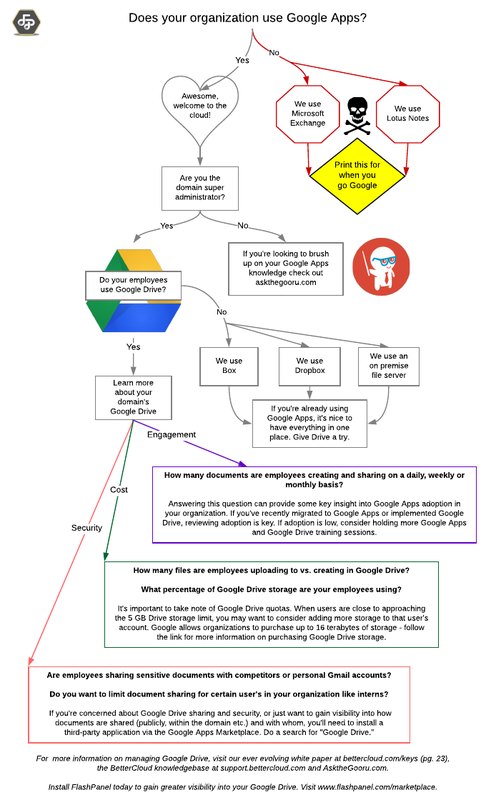 To see the full context of this decision tree, read "The Path to Google Drive Enlightenment." "We’re always on the lookout for great applications that help us save time, add efficiency, and provide vital tools for collaboration. Lucidchart is definitely one of those tools." See for yourself why BetterCloud and other top companies make the switch to Lucidchart. Use Lucidchart to work visually in any role.